Ancient Stones - Lothian - 039 Cairn, Beecraigs, Torphichen. The remains of this turf covered burial cairn measuring some 11m in diameter are situated a mile or so to the west of Beecraigs Country park, due south of Linlithgow. Around its perimeter is a kerb of large boulders, of which 12 are visible, all but forming a circle. A small modern cairn surmounts the older cairn. There are also numerous boulders around the cairn and some may simply be the result of field clearance. An old quarry not far to the west also contains a large number of stones from field clearance, some of which might have been associated with the cairn at one time. The cairn is best reached from the minor road between Dechmont and Linlithgow, starting at the access area to Longmuir Plantation. A forest track leads to the foot of the hill. At entrance area to forest. The remains of the burial cairn near Riccarton Hills was a bonus as I had no idea it existed when I planned my trip to the area. It was when scanning the horizon from Cockleroy Hill that I noticed a jumble of boulders through the binoculars. I just had to check it out. The setting is quite superb with open views all round and the outline of the cairn is quite distinct, although many of the stones have been scattered. However, some of the larger boulders may be the result of field clearance. 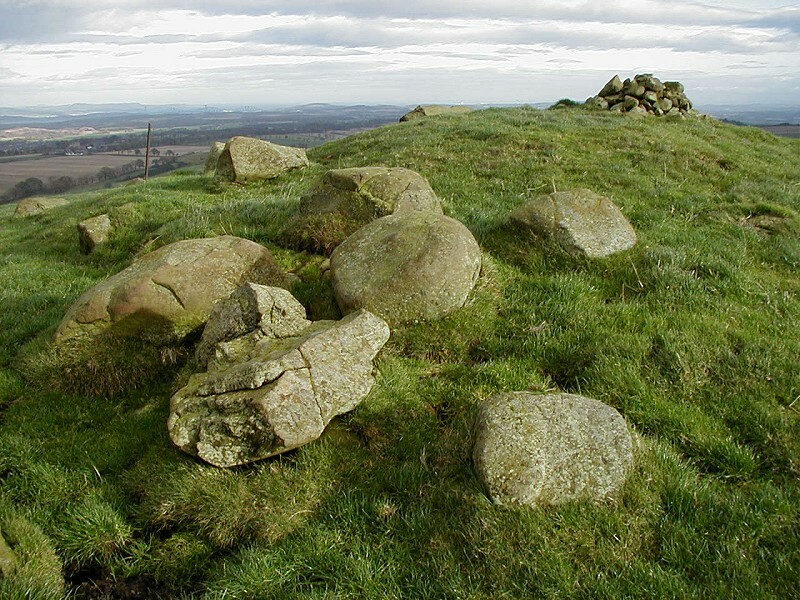 An old quarry to the east holds many boulders of similar shape and size to those still present on the cairn, some may originally be from the cairn itself.